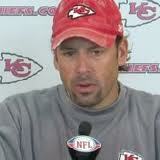 If Todd Haley has it his way, he’ll look like Santa Claus. Just don’t expect him to change his red hat, you know the sweaty-salt stained hat he’s been wearing lately? The hat, along with his beard, is staying as long as the Chiefs are winning.